Just a few days ago, we predicted the Top 5 expected features that will be landing on WhatsApp. And looks like, we have already started getting some new features on the messaging app. Just a while ago, WhatsApp has added two features in the beta version- call back and WhatsApp Voicemail. Probably we will soon be getting some other new features as well. The WhatsApp Beta version 2.16.189 has got the update and these features have been added. The callback feature is just a feature that will be useful if you need to call someone urgently. In the case of a declined or unanswered call, you can just tap on ‘Call back’ and WhatsApp will try to call that person again, right from the calling screen. This will save time for users and it is more convenient than going back to the contacts or cal history and calling again. Now, the second feature is voicemail, which lets you send a voicemail by tapping and holding the voicemail icon. Once you have recorded your voicemail, just release the icon and it will be sent to the recipient. Now, these options are useful enough. 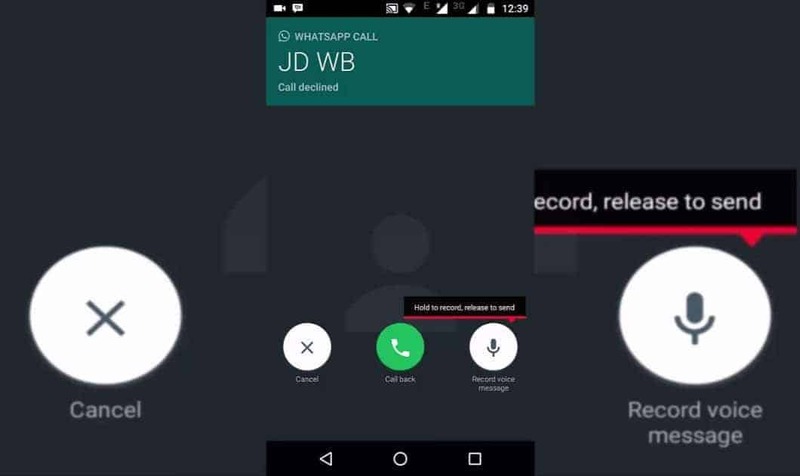 The WhatsApp Voicemail feature is used just like any voice message. But the users don’t need to go back to the conversation, tap and hold the mic icon to record and then send the message as everything happens right from the calling screen! Pretty convenient and useful. Well, WhatsApp is being rumored to bring the video calling feature soon, for more updates keep visiting our site and also join us on Facebook so that we can serve all the news, updates, leaks and rumors and reviews right now your newsfeed. Those who are willing to try this new feature can download and install the APK provided. You can download from the Dropbox link below.